Collaboration knife build with my Seiryu Battle Cleaver and Copper Shed handle scales. The Toso EDC knife made the cover of the page for the acid etching produced by the vinyl stencils. The Original 13.5″ Texas Warrior was the featured knife on this site for its unique design and hamon. 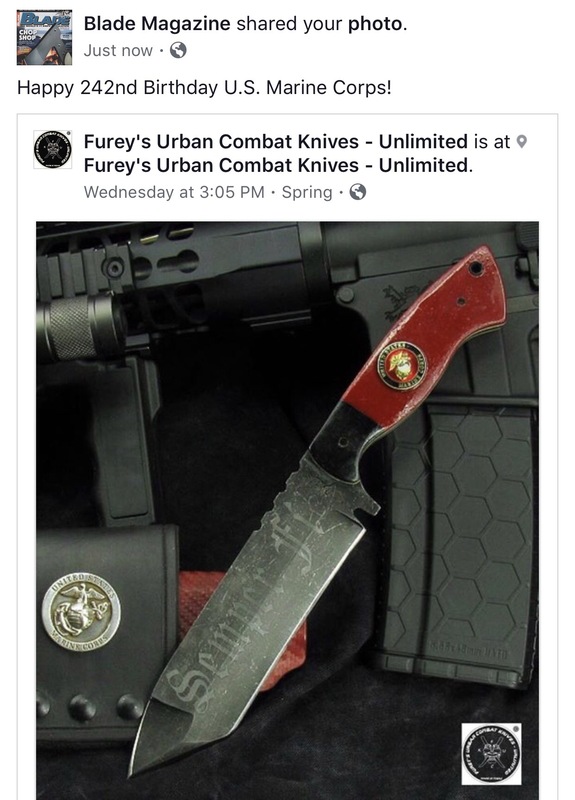 The “Texas Warrior” original knife was made the featured knife cover photo. The Resukyū Friction Folding knife was selected as the featured knife for the cover picture of the Shadow Warriors business page. One of my Seiryu Battle Cleavers collaborations with the Copper Shed is the featured cover photo for the Missouri knife maker’s and collectors group. The “Doku” Custom Karambit was selected as the featured cover photo. The “Hebi” Mini-Bowie and Maker write up feature. 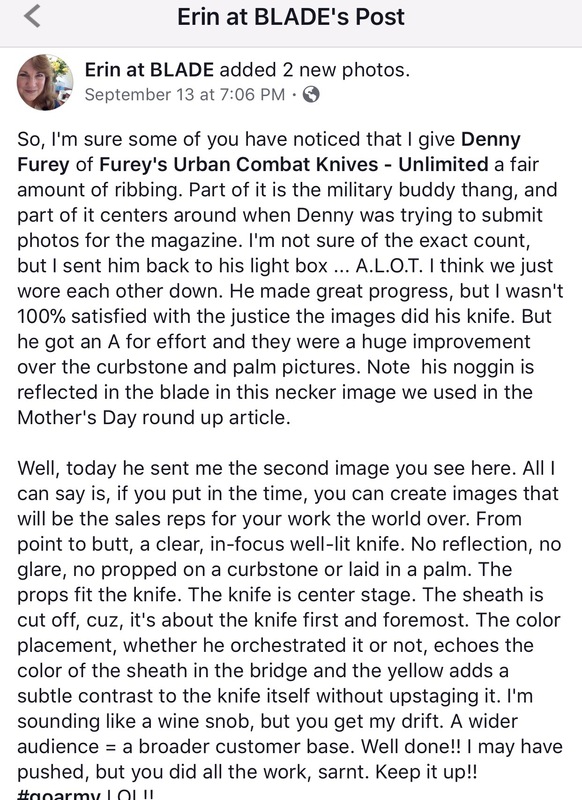 QDK (Quick Defense Knife) write up for Mother’s Day. The Surrashu V2.0 selected as featured cover photo. 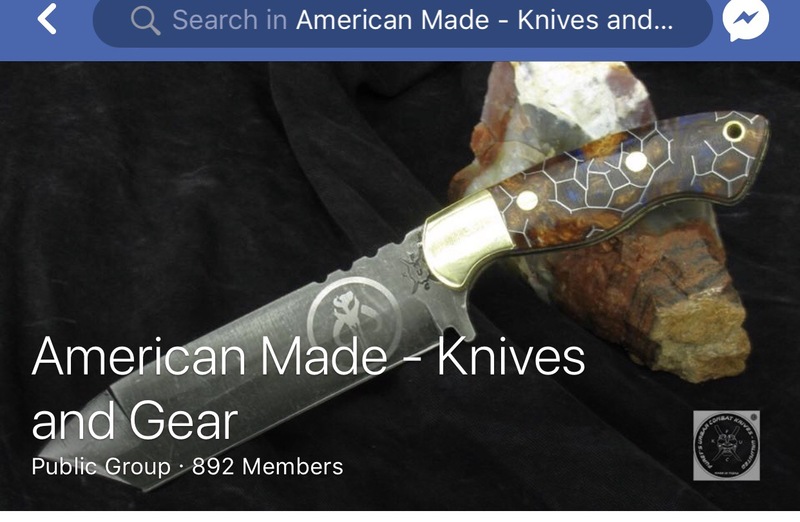 My Texas Warrior and American Warrior knives were made the featured cover photo on the FaceBook business page. 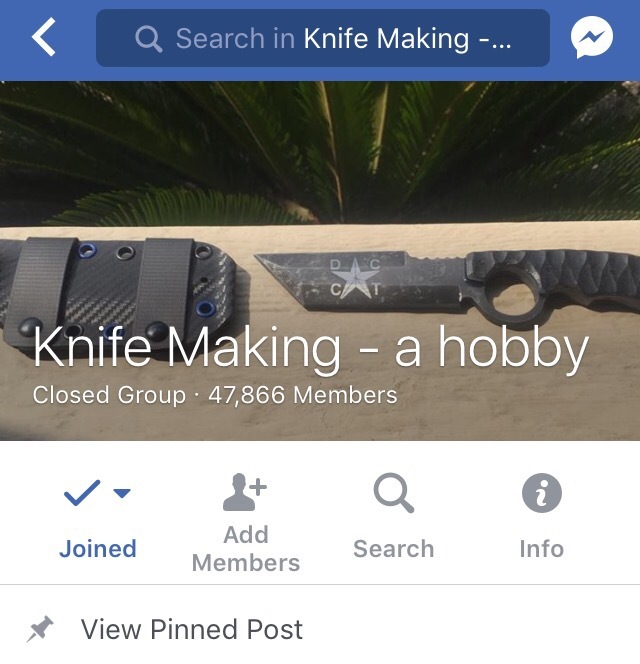 The Thin Blue Line Warrior was made the featured cover photo for Knife Making – A Hobby on Facebook. My “Monsutā” Ringed Western Tanto was made the featured cover photo for the FaceBook group. 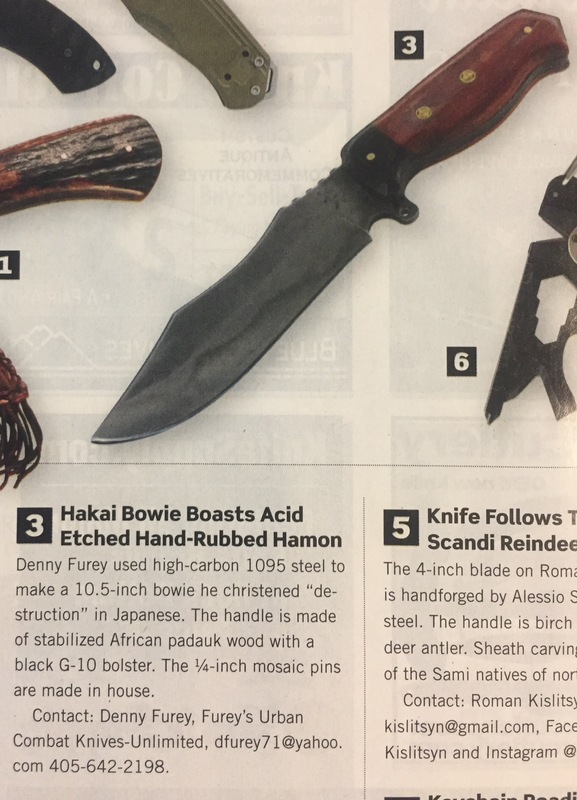 My “Hakai” Bowie was featured in the “What’s New” section of the September 2017 issue. The Prototype I built of the C.U.M.A. Monster Cleaver I built upon request for Waysun Johnny Tsai (TOPS Knives designer). 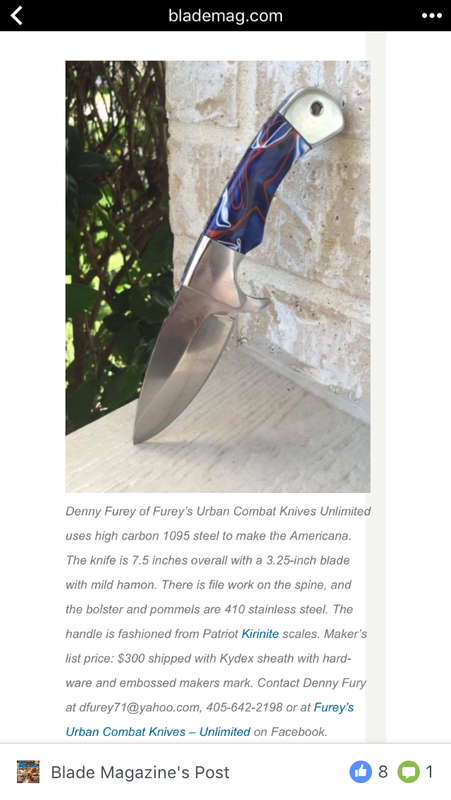 My “Americana” made the online Blade Magazine 4th of July article. 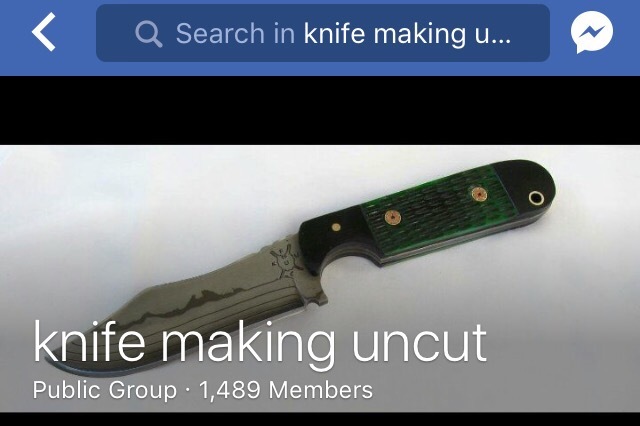 A “Monsutā” Mod knife was made the featured knife cover photo. 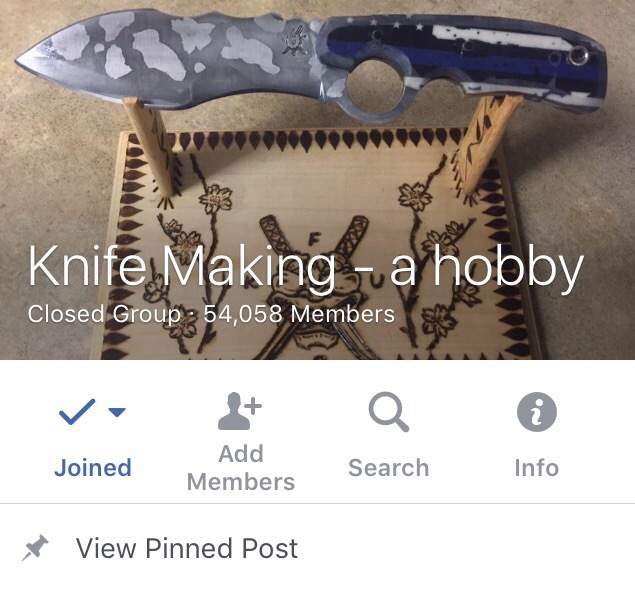 The Ringed “Surrashu” made the featured cover photo for “Knife Making – a Hobby” Facebook Group. 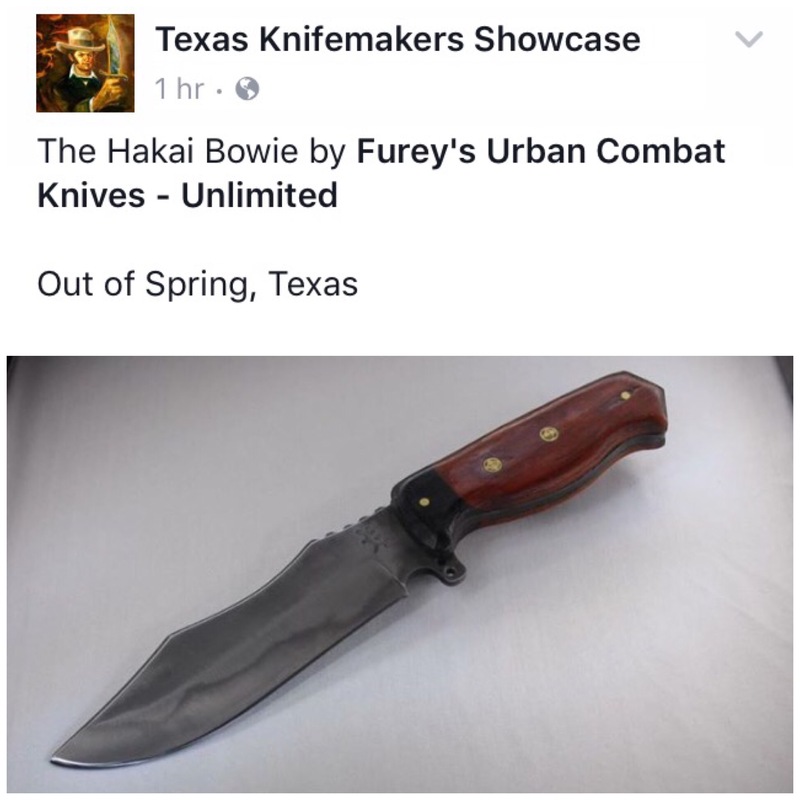 The #1 “Hakai” Bowie was featured in the Texas Knifemakers Showcase page on Facebook. Honored to have my “Bunri-ki” listed on the Texas Knifemakers Showcase FaceBook page. 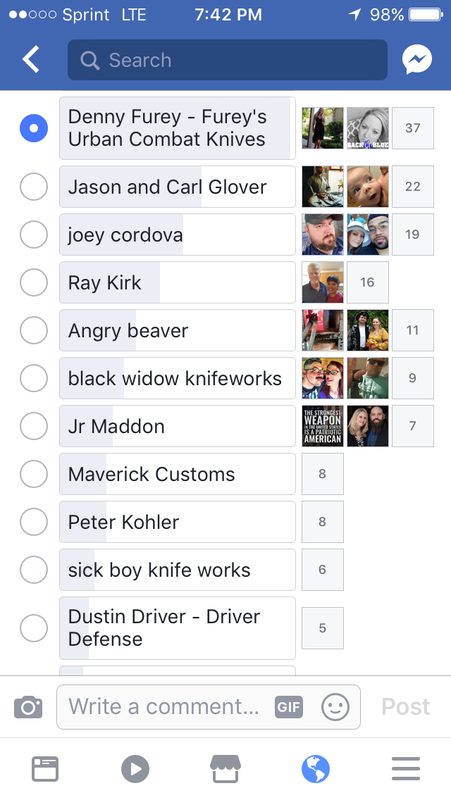 Selected as Knifemaker of the Month by popular vote in the Real Knifemaker’s of America Facebook group. 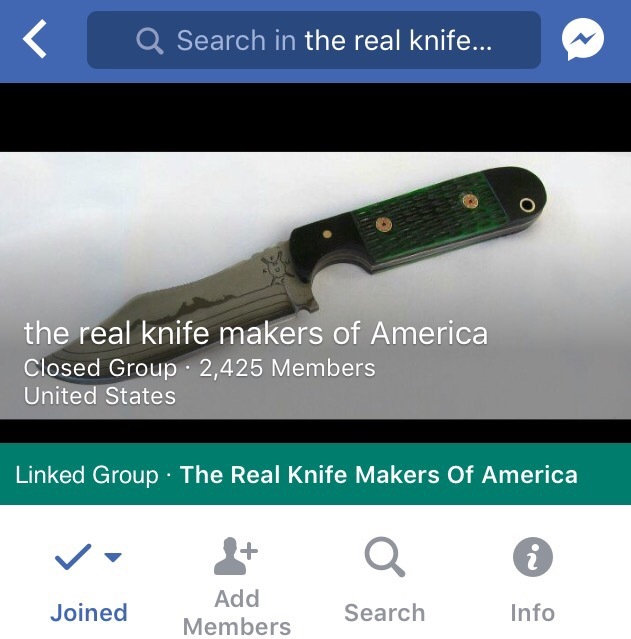 The “Hebi” was made the featured photo for the Real Knifemaker’s of America group page. 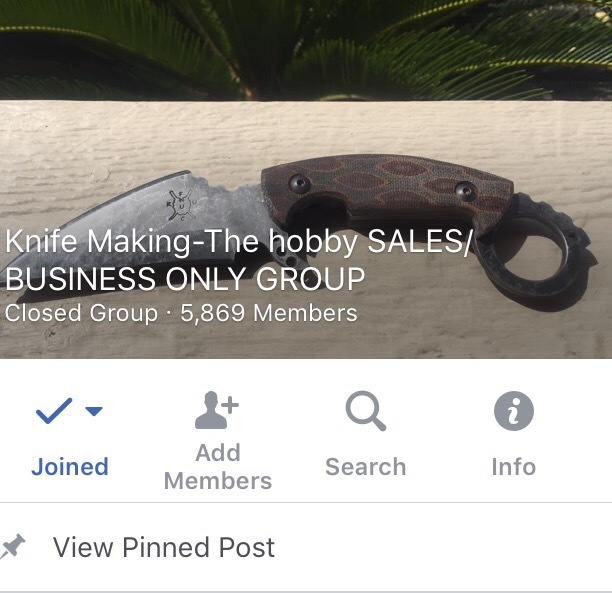 The “Hebi” was made the featured photo for the Real Knife Making Uncut FaceBook group page. 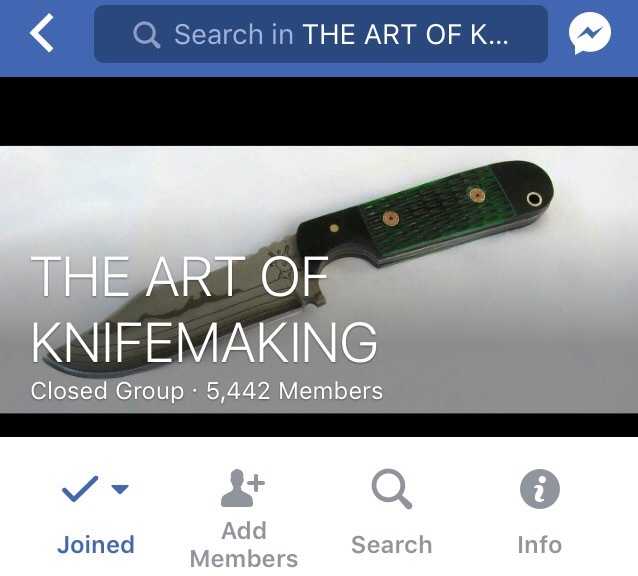 The “Hebi” was made the featured Cover Photo for The Art of Knifemaking Facebook page. 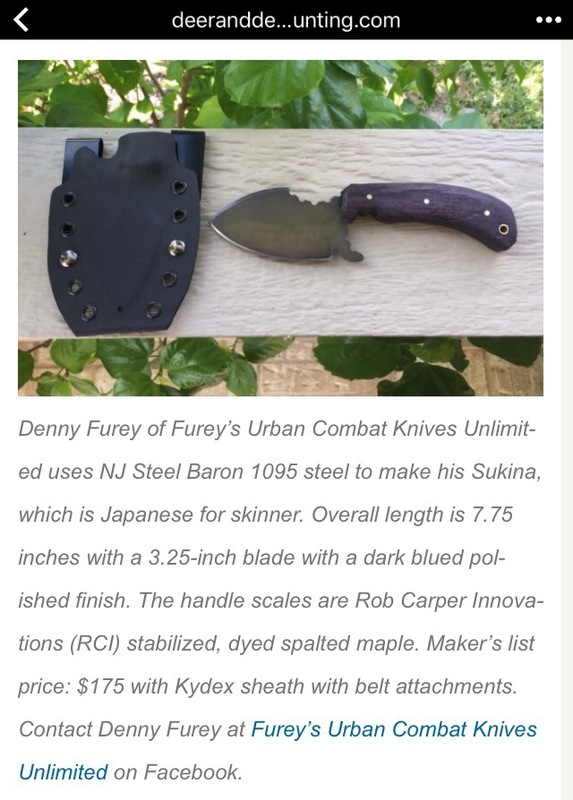 The “Sukinā” Skinner featured in the online Blade Magazine. The “Soturaiku” Combat Tanto was made the featured cover knife photo. One of my customer’s collection of my blades as the featured Cover Photo of the Shadow Warriors Community FB page. 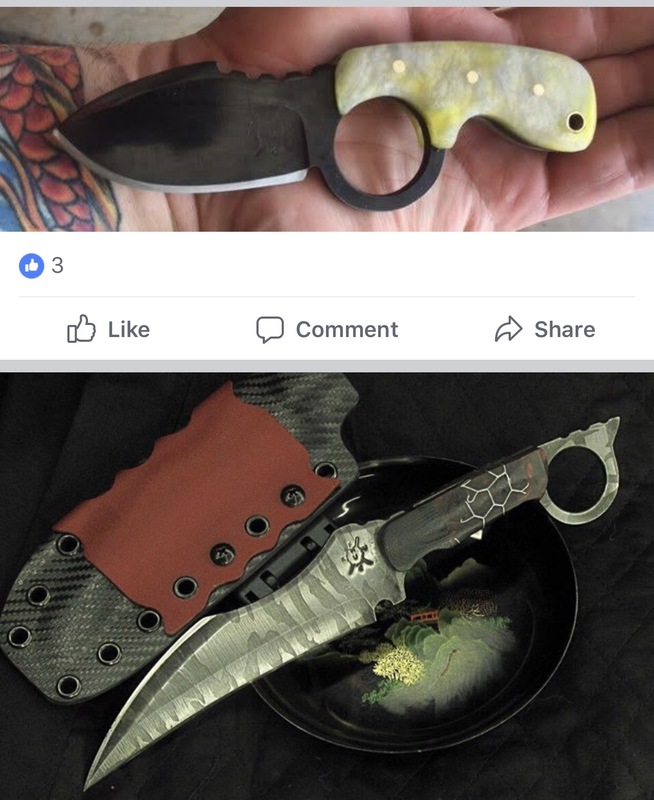 Tatakai Combat Karambit as the featured Knife Cover Photo on the Knife Making and Leather Work FB page. 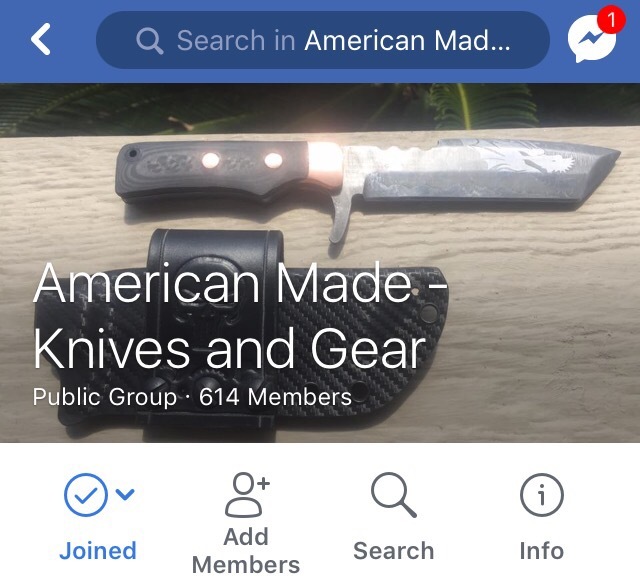 The “Barakūda” Combat Tanto made the featured Cover Photo for the American Made – Knives and Gear FB page. Honored to have some of my blades displayed and craftsmanship acknowledged. 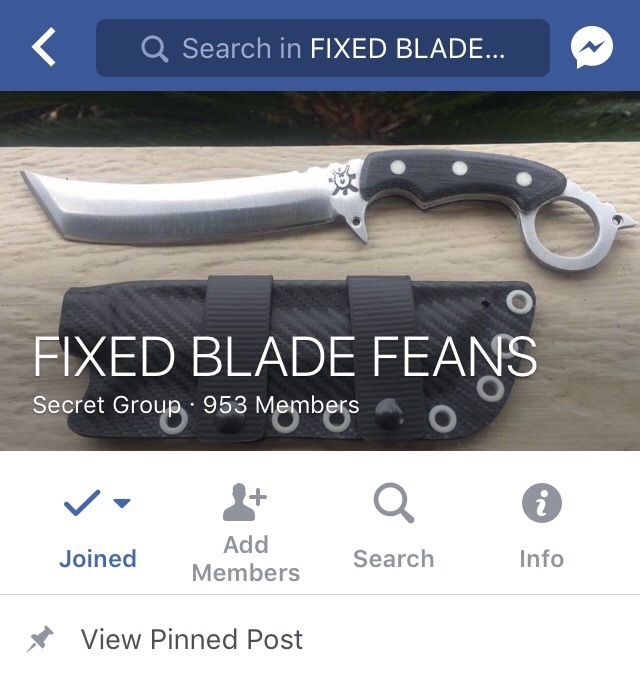 My custom hidden tang Bowie made the featured cover photo. A QDK and the Tatakai Mod photographs were used to show photography progression in the knife industry. 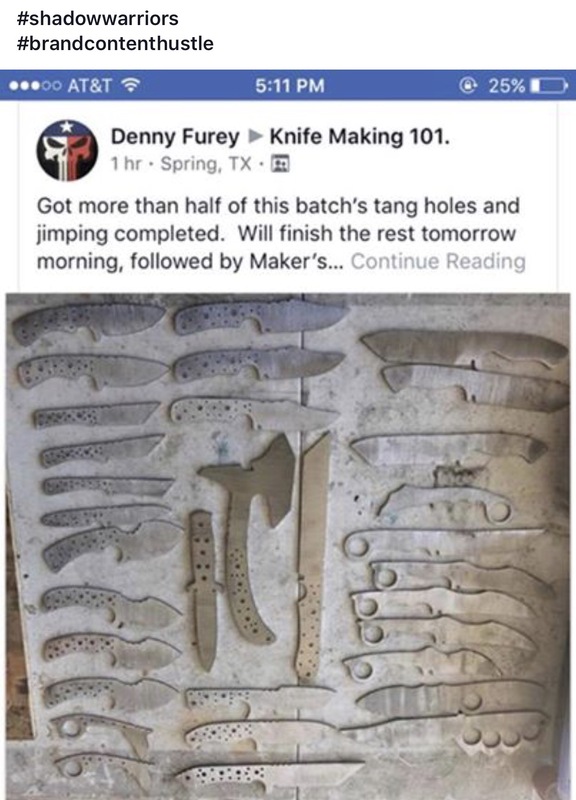 A photo of my blank making process was made the featured cover photograph of the FaceBook group, American Made – Knives and Gear. 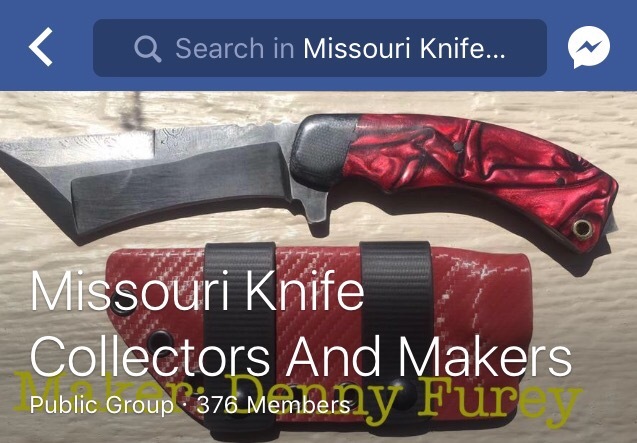 The Muhōmono Bowie is the featured cover photo for the Missouri Knife Collectors and Makers Facebook group. I was recognized for my business approach and work ethic. The StreetHawk Urban Tommy was the featured in the Texas Knifemaker’s Showcase Facebook page. The Resukyū GITD friction folder was featured in a Halloween edition special for Blade Magazine-Online. 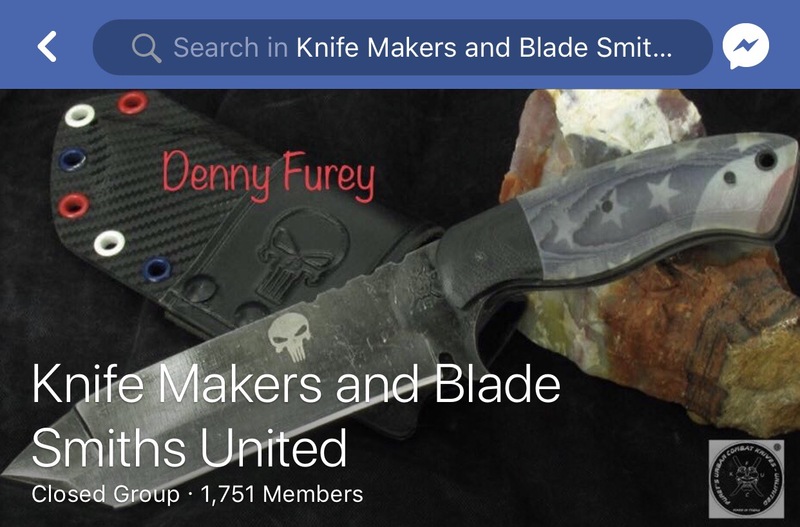 Honored to have the Punisher Soturaiku made the featured cover photo on the Knife Makers and Blade Smith’s United FaceBook group. Blade Magazine used my Marine Commemorative Soturaiku for their Corp Birthday dedication. 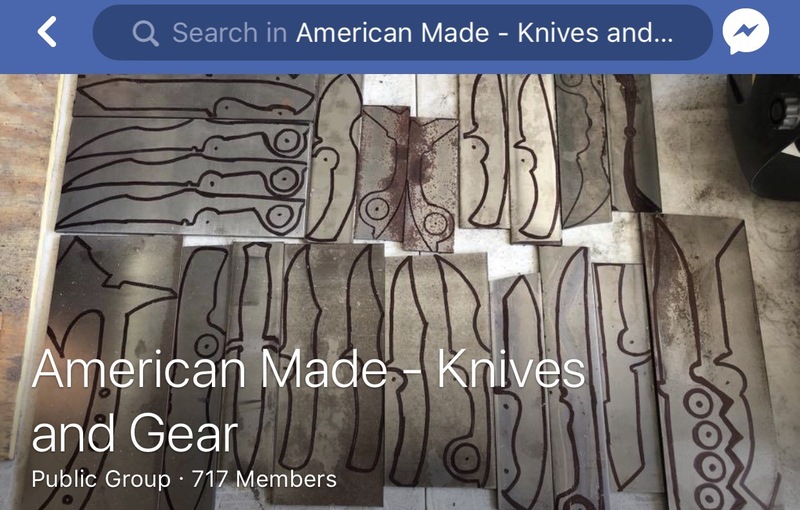 The three Old Glory mini-Bowie’s were used as the featured cover photograph for the American Made – Knives and Gear FaceBook Page. Featured Meet the Maker in the Shadow Warriors Community Facebook page. A special project blade (work-in-progress) was made the featured cover phot for the Shadow Warriors Community Facebook page. The Western Recurved Tanto with RCI emerald handle scales and brass hardware was made the featured cover photo for the American Made – Knives and Gear Facebook page. I am honored to have been featured in an article for Defender Magazine, a U.S. Air Force Security Police/Forces publication. 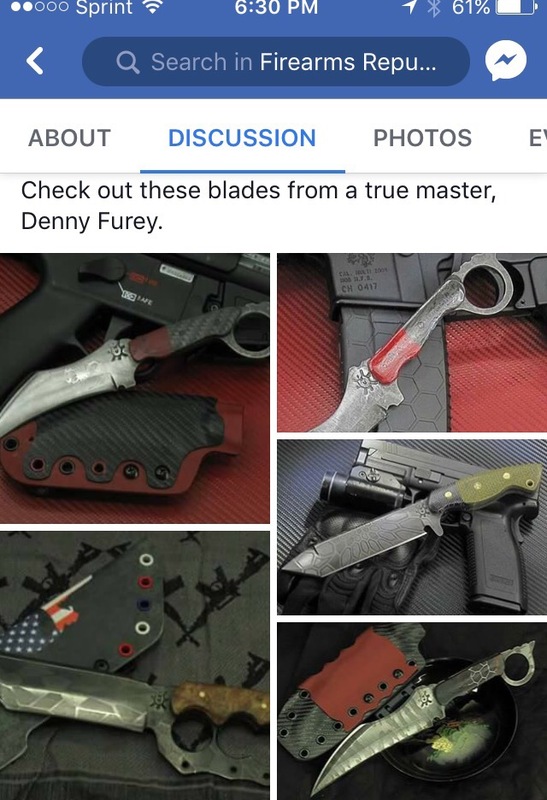 Honored to have a Mizo Western Tanto Trench knife acknowledged in the Stay Bladed New Hampshire chapter FaceBook page. Honored to have my Mandalorian Himitsu/Barakūda Hybrid featured in the Texas Knifemakers Showcase on FaceBook. 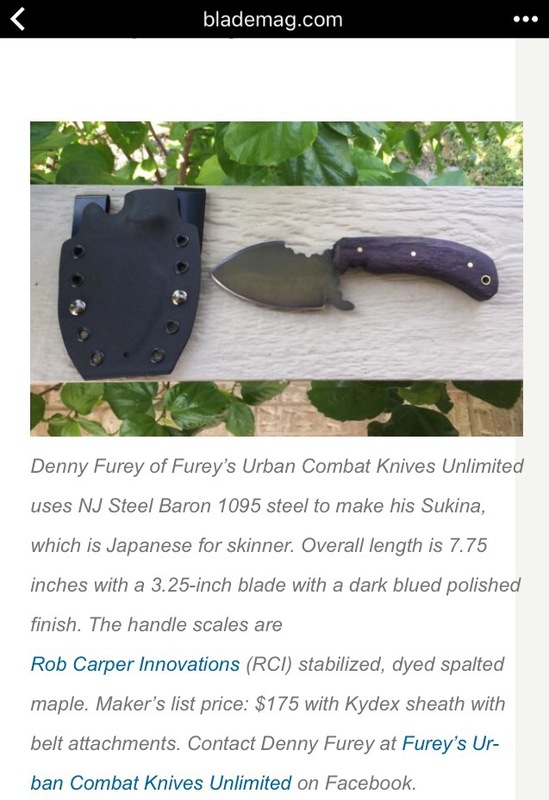 My Sukina hunter/skinners were featured in Trapper & Predator Caller Magazine in an article titled “Dream Blades for Trappers”. The Three Brothers mini Bowie’s were spotlighted on the Facebook page of the gentleman that custom makes the Flag scales used on them. 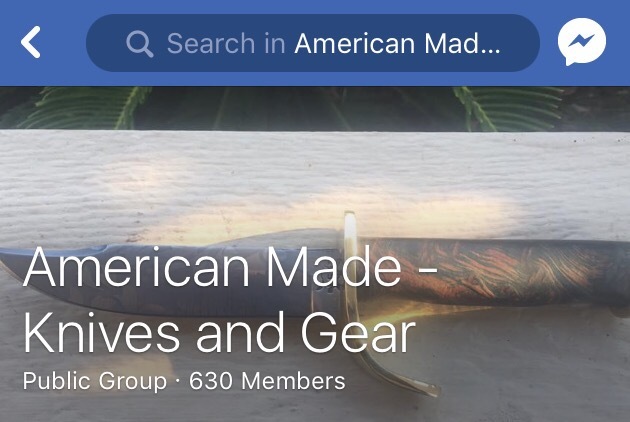 The Custom Eli blade and sheath I just finished we’re made the featured Cover Photo for American Made-Knives and Gear on Facebook. The “Manmosu” (Mammoth) Cleaver made the featured Cover photo for the Missouri Knife Collectors and Makers FaceBook page. One of my Punch Daggers was featured on the BUY-SELL-TRAIN! Stay Bladed! Facebook page. My sub-hilt kiridashi prototype recognized on the 50 Shades of Blade Facebook group. 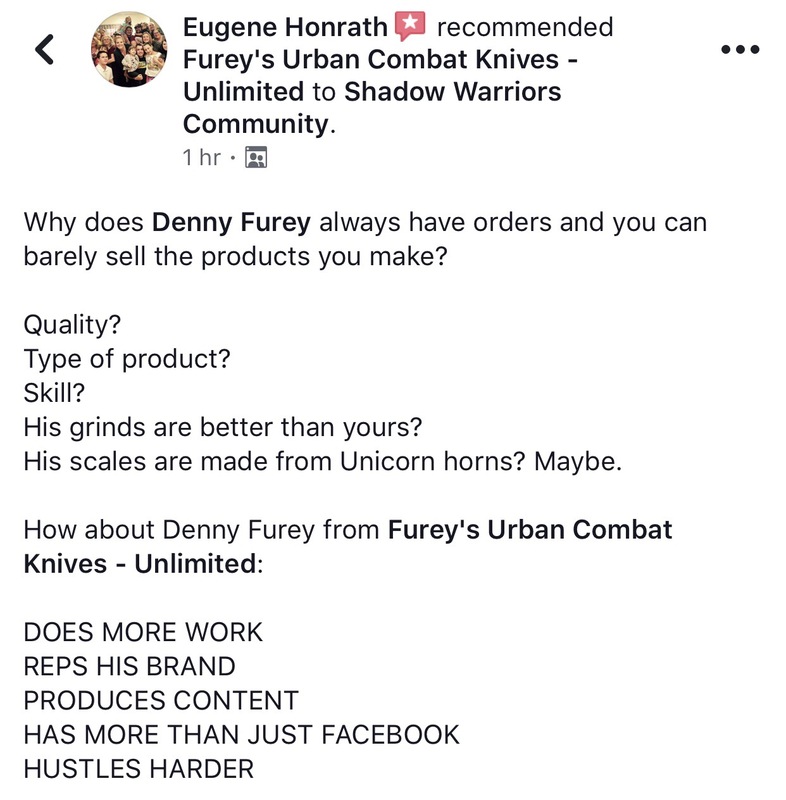 Honored to have Furey’s Urban Combat Knives-Unlimited being represented up in Oklahoma by dirt track racer, David Jacobs. The Twin StreetHawk Combat Tomahawks featured on the BUY-SELL-TRAIN! Stay Bladed Facebook page. U.C.U.T. 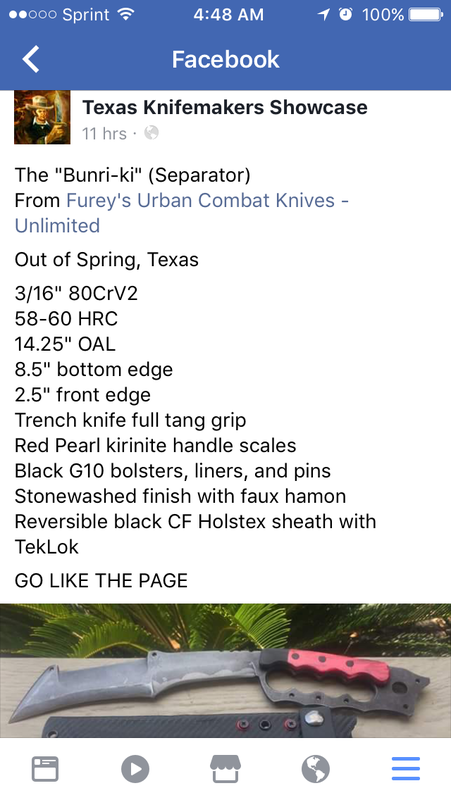 (Urban Combat Utility Tool) make the cover photo is the Tactical Knives Facebook page. The “Kizamu” Fighter front ring model spotlighted in the BUY-SELL-TRAIN! Stay Bladed! Facebook group. The twin Americana blades were featured in the BUY-SELL-TRAIN! Stay Bladed! Facebook group. The “Mizo” Trench Knife made the featured cover photo for the Missouri Knife Collectors and Makers Facebook page. A “Mizo” Trench Knife and the “CUMA Monster Cleaver” prototype I made for, and based on the design, by Johnny Waysun Tsai featured on the GETBLADED! Facebook page. Honored to have my USMC tribute “Soturaiku” made the featured Cover Photo of the Back Country Blademakers & Supplies FaceBook Page. Actor, MMA Fighter, and Martial Arts Legend, Cung Le, promotes my knives after receiving a ringed recurve tanto prototype. 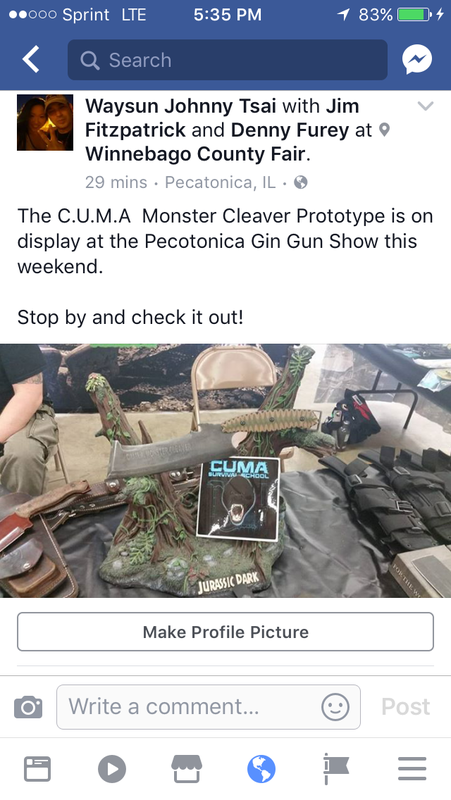 The Soturaiku was featured on a post on The Bladed Ones FaceBook Page. Decal advertisement on a customers vehicle was made the featured Cover Photo of the Shadow Warriors Community Facebook page. 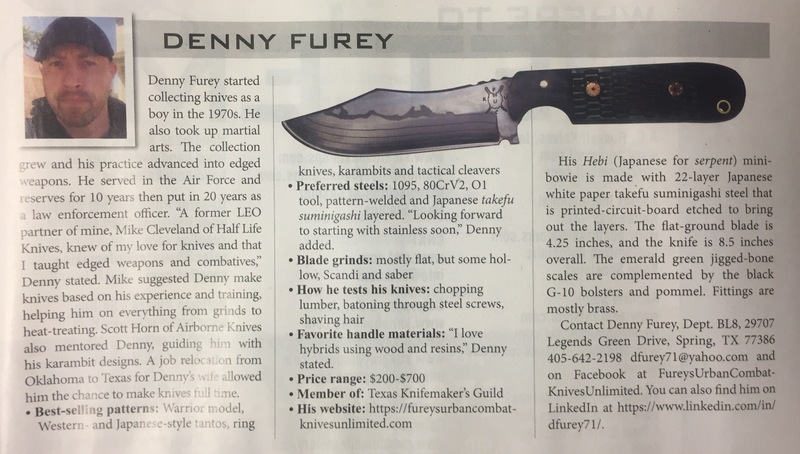 Listed in June 2018 Blade Magazine exhibitor guise program (page D). The U.C.U.T. 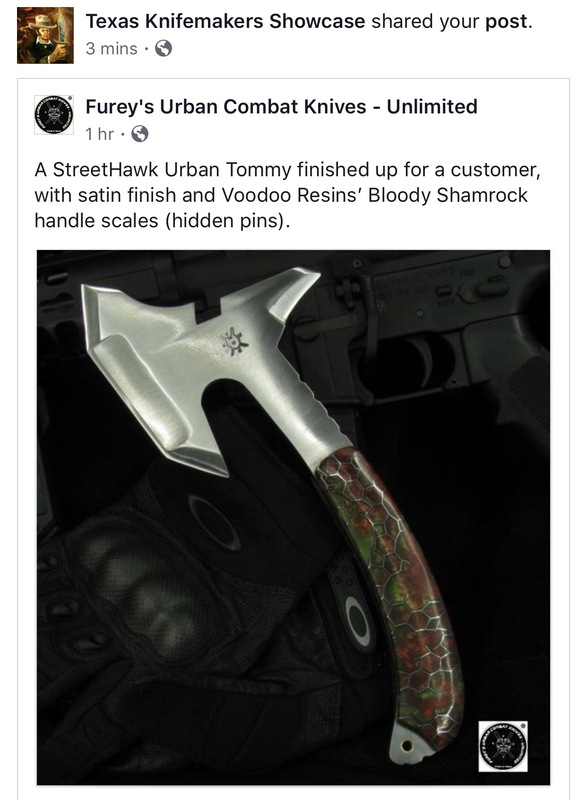 (Urban Combat Utility Tool) was made the featured cover photo for the Missouri Knife Collectors and Makers Facebook page. A StreetHawk Urban Tomahawk was featured in the Get Bladed! Facebook group. A U.C.UT. 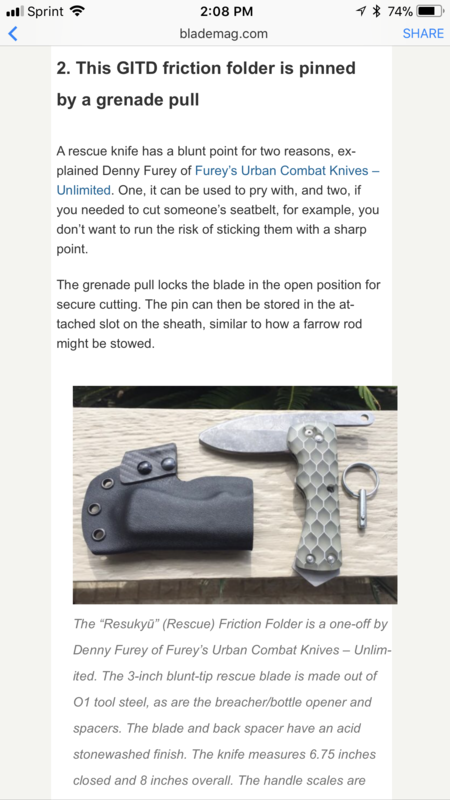 (Urban Combat Utility Tool) was featured in the Get Bladed! Facebook group. 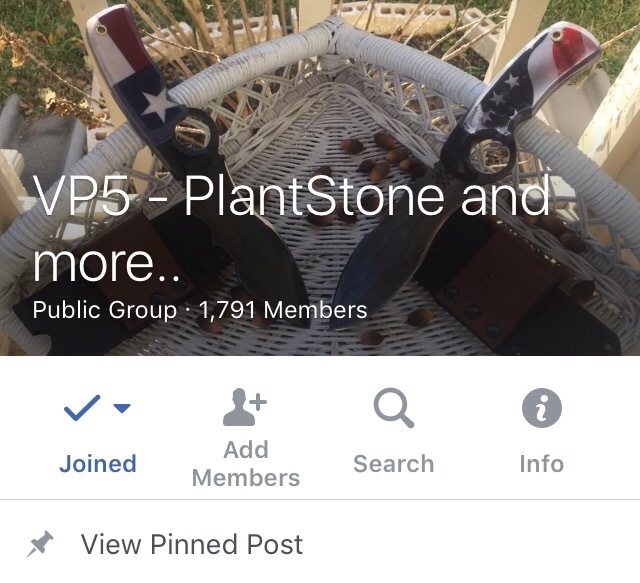 The Warrior with snakeskin Carvex scales was made the Cover Photo for the VP5 – Plantstone and More FaceBook Page. 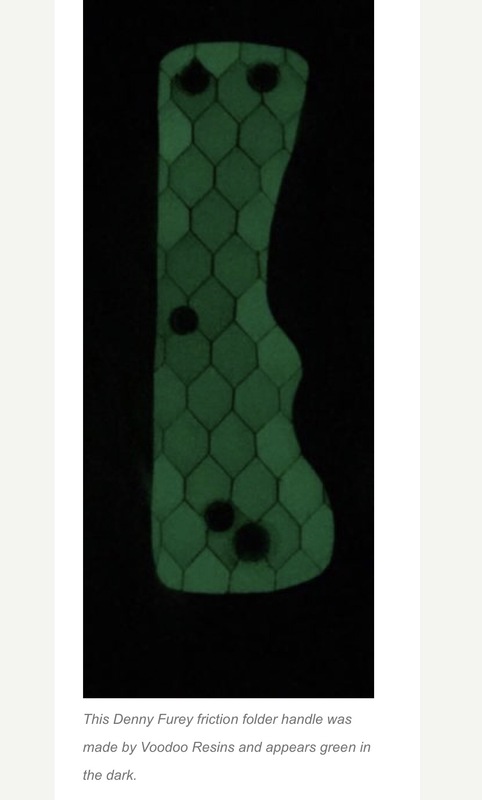 The Kizamu with toxic green accents was highlighted in the ANGRY BADGERS (Blade Club) Facebook group. Honored to have a Kizamu rear ringed model and trainer highlighted on the GET BLADED! Facebook Page. Honored to have the Arashi live Blade and trainer/prop, which will be appearing in the film titled “The Target” with Cung Le was highlighted in the GET BLADED! Facebook group. The photo of the preliminary mock up of the StreetHawk Combat System was featured in the STAY BLADED! Facebook group. 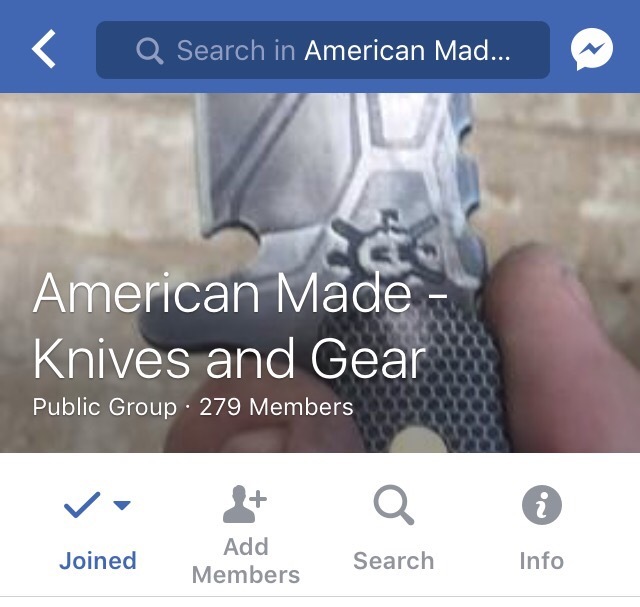 The “Zasshu” was made the featured Cover Photo for the Edc- Knives and Gear FaceBook Page. The custom Arashi ring knife was featured in the promotional photo shoot for the movie The Target, starring action star, Cung Le. 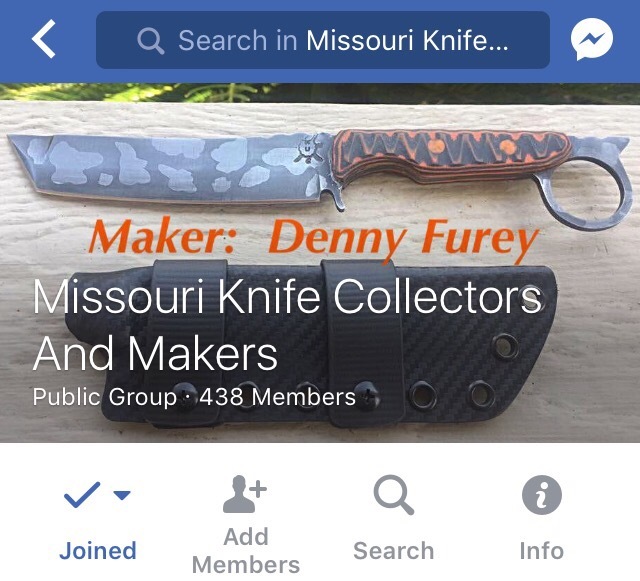 Honored to have my “Zasshu” made the featured Cover Photo for the Missouri Knife Collectors and Makers FaceBook Page. 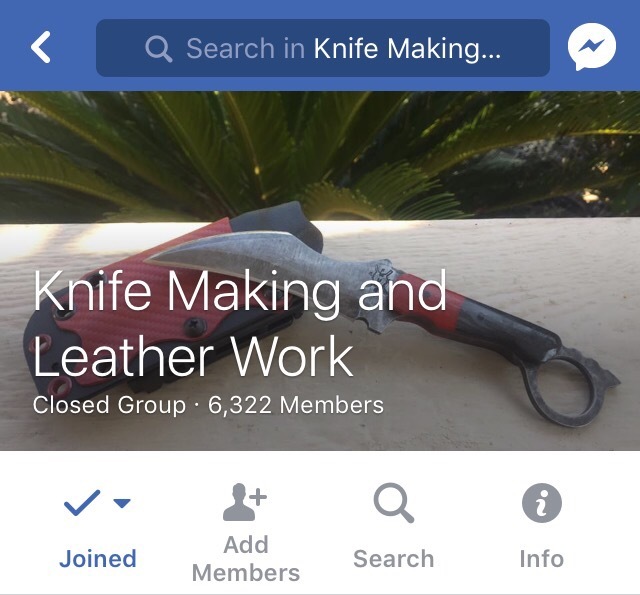 The “Zasshu” was the runner-up Photo for selection as the primary banner picture for the Facebook group Custom Knife Network: Handmade & Hand Forged Knives for the month of September 2018. I was interviewed for a featured Meet the Maker of my blades and designs. the featured Cover Photo for the Gulf Coast Knives and Blades of Excellence Facebook group. The “Arashi” being wielded by the star of the film titled, The Target, on a casting call poster. Honored to have my Joe Kious style tribute fighter made the featured Cover Photo for the Missouri Knife Collectors And Makers FaceBook page. 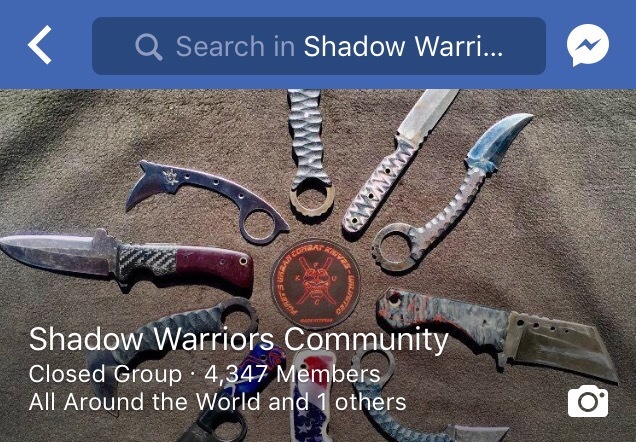 Honored to have my new neck knives made the featured Cover Photo for the Shadow Warriors Community Facebook page. This is the racer we sponsor, David Jacobs, who took the national championship in turf car his first year running! Congratulations! A pic sent to me by one of my military brothers and customers using my first hunting style knife I ever made. The “Bossuru” Combat Tanto was a featured photo on the GET BLADED! Facebook page. 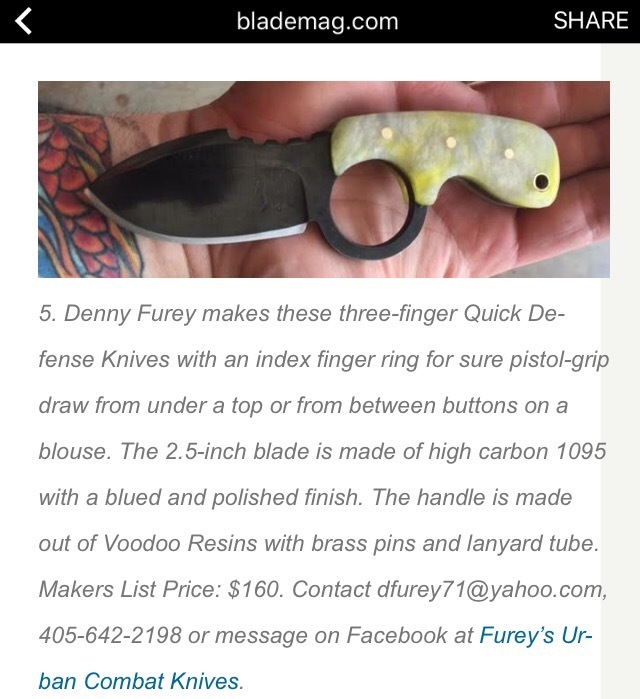 The Subhilt Seax was a featured photo on the GET BLADED! Facebook page. 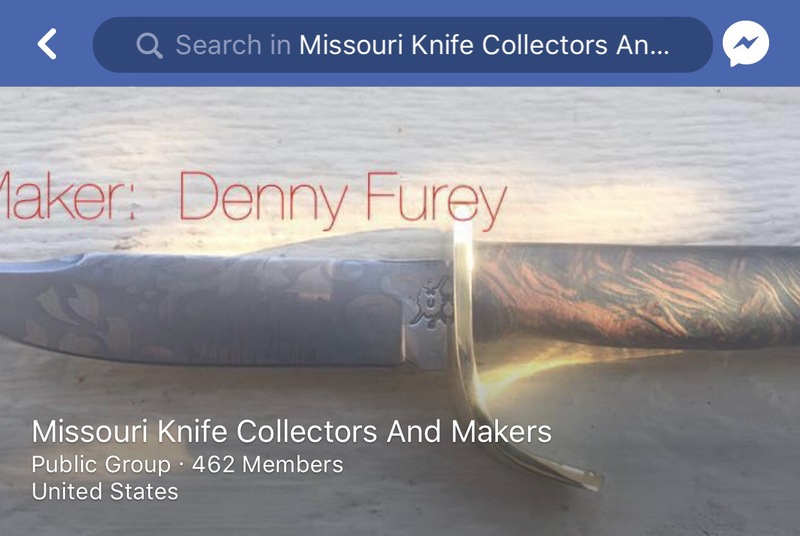 The pair of “Suiryoku” push daggers made the featured Cover Photo for the Missouri Knife Collectors and Makers FaceBook Page. 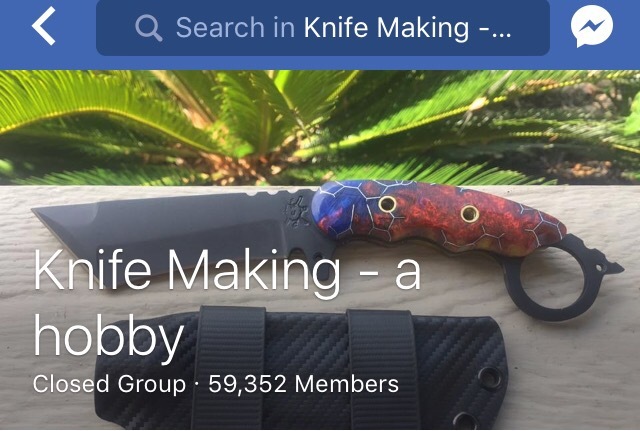 The Texas Flag “Hakai” Bowie was made the featured cover photo for the EDC-Knives and Hear Facebook group. 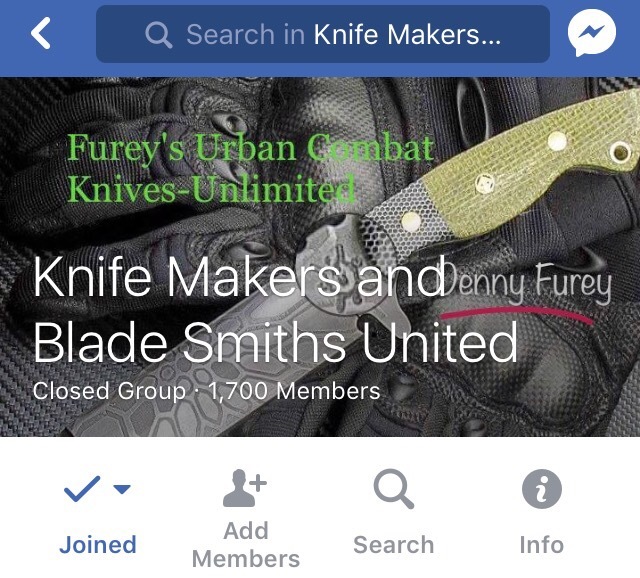 Featured as approves knife maker for the Thunkgang edged weapons FaceBook group. I was spotlighted in a business group for my aggressive marketing strategy as it pertains to my business. One of the first official movie posters for the film “The Target” starring Cung Le and a Blade made by yours truly, the “Arashi”, which will appears in the film. Honored to have one of the versions of my “Bossuru” Combat Western Tanto in the spring edition of Prepper Survival Guide magazine.